Main sponsor of The ARB Show 2016 for the twelfth year running, STIHL will give visitors the chance to get hands-on with new and familiar chainsaws, display its latest PPE gear and have its impressive Treevolution team on site to demonstrate its top-of-the-range tools in action. STIHL has launched a range of new arb equipment for 2016 that will be presented at this year’s Arb Show 2016. 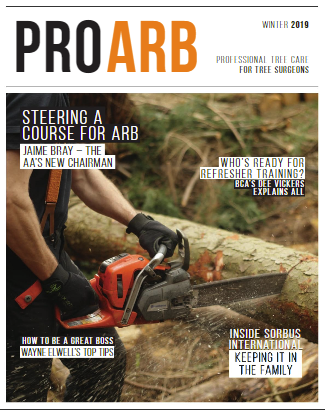 From forestry chainsaws to PPE equipment there is something for all professional arborists. Visitors will also be in with a chance of winning the MS 201 TC-M 14-inch, top-handled chainsaw. Visitors can simply register their details at the entrance to the show to be in to win. STIHL will also be presenting the newly upgraded MS 261 C-M at The ARB Show. The professional chainsaw has had a 300g weight reduction (now at 4.9kg) and a 0.1kW power increase for a better power to weight ratio, as well as an improved sprocket cover for better chip guidance. This powerful chainsaw for professionals ensures up to 20% less fuel consumption and up to 50% emissions reduction compared to the same power STIHL two-stroke engines without 2-MIX technology. The impressive MS 201 TC-M will be on show and given away to one lucky winner at The ARB Show 2016. A high performance saw designed with professional users in mind, the MS 201 TC-M not only delivers impressive 1.8kW power, it does so at the meagre weight of 3.9kg. What’s more the MS 201 TC-M boasts STIHL M-Tronic, 2-MIX technology, providing optimum engine performance from the word go. New additions to STIHL’s PPE range include the ADVANCE X-LIGHT trousers. Made from ultra-light, extremely breathable AVERTIC pro lite cut protection material, developed exclusively for STIHL, these dynamic chainsaw protective trousers are made up of six layers and are the lightest in the ADVANCE series. Also to be showcased in STIHL’s PPE range will be the ADVANCE X-FLEX trousers. Available in a lightweight and highly breathable arborists’ Design C; their smart and distinctive peat and orange colours give them a modern twist to the high-tech, durable design. For more information visit www.stihl.co.uk.